This collection of 112 new patches for Omnisphere™ is perfect for creating the latest styles of EDM (Electronic Dance Music). We’ve loaded them up with staple sounds such as wobble basses, pulsing basses, pads, atmospheres, leads, risers, percussive loops, and BPM-driven modulated synths. 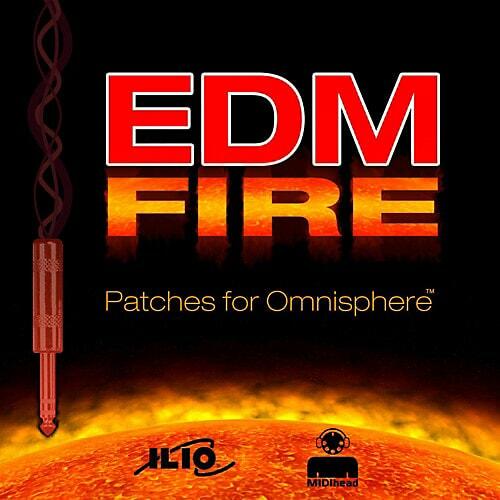 While ILIO-EDM Fire focuses primarily on EDM styles, feel free to toss your pop, hip-hop, and even film and television music creations on this grill of patches. Each one has been meticulously crafted, pulling from both Omnisphere’s powerful synthesis engine, and its vast arsenal of included sonic samplings. ILIO-EDM Fire focuses on the use of the modulation wheel for fast, sound-altering control. Many patches are also optimized for use with The Orb, giving you even more real-time control on stage and in the studio.